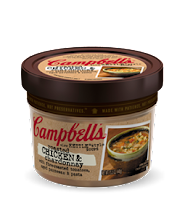 Campbell's is a company that has been around forever with tons of different soup options. Some of my classic favorites include tomato and bean with bacon. 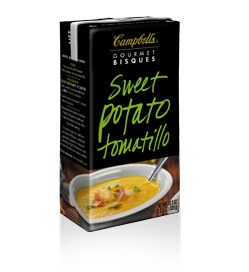 I was recently contacted to try some of Campbell's new gourmet soups. The flavors sounded really interesting so I decided to give them a try. Here are the soups that I was sent: Buffalo chicken, sweet potato tomatillo, Thai tomato coconut, roasted chicken and chardonnay and sun ripe yellow tomato. I was so excited to try these out and see what my husband and I thought. He took the chicken and chardonnay soup to work because it was already in a portable to-go container. The container has 2 servings of soup which was perfect for my husband for lunch to fill him up. He said that he really loved the soup. He said that it was rich and liked the corn a lot in it. I tried the sun ripe yellow tomato and enjoyed it a lot as well. My dad has always a ton of tomatoes in his garden and we love the yellow variety. I love the Campbell's has come out with a soup made of yellow tomatoes. For those of you who have not tried yellow tomatoes yet, they are a bit sweeter and less acidic. This soup was tasty and would be perfect matched with a grilled cheese. The sweet potato tomatillo is great for fall. I like it with a dab of light sour cream or plain Greek yogurt in the center topped with some chopped chives. Also, when possible, choose low-sodium varieties of soups or limit other sodium-rich foods with your meal as canned soups are often high in sodium. Campbell's has done a good job of increasing their line of products and including gourmet and uncommon ingredients. Disclosure: I received these products for free. As always, all opinions are my own. 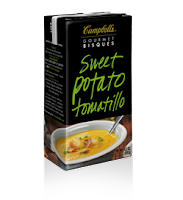 The giveaway will be for a Campbell's "Soup Season" Kit including a variety of gourmet soups. My favorite Campbell's soup is chicken noodle. Love the steak and potato. My favorite is the classic Tomato soup, especially with grilled cheese. Chicken noodle is a classic!! Buffalo chicken sounds delicious!